The adventure of One Green Paperclip in Fort McMurray continues! Every day I open my email inbox and wonder what will be waiting for me - and a couple of days ago it was a new trade offer, and an intriguing one at that. It was an email with an offer from a local radio station (and I'm very pleased the local stations seem to have embraced this adventure with the Intrepid Junior Bloggers and I). It was an offer with a great twist, too. 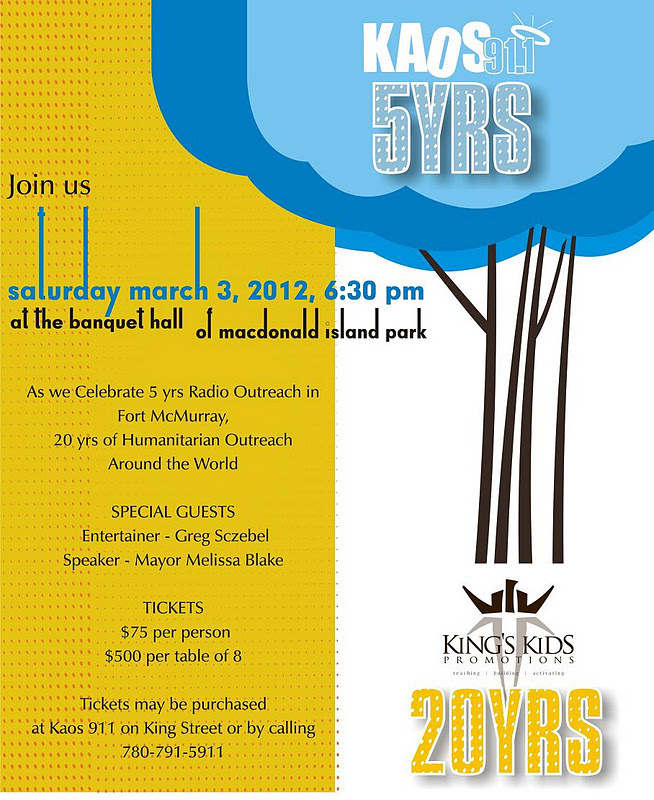 It was two tickets to the upcoming KAOS 91.1 Banquet and Silent Auction, the fifth annual such dinner KAOS has hosted. KAOS is a local non-profit radio station that is very involved in the community, hosting many free community events. They also give local non-profit organizations radio time to discuss their services, which I think is pretty amazing considering most non-profits have small budgets for promotion and advertising, but often are the most in need of getting their message out into the world. But KAOS wasn't just offering two tickets. Even better was their plan for the hockey memorabilia - the silent auction at the banquet (check out this video to see more about the banquet!). When I got the email I quickly rounded up the Intrepid Junior Bloggers before they could head out the door to school and asked for their opinion. They quickly approved the deal, and said they couldn't imagine a more win-win situation for everyone. We got tickets to trade, KAOS got a silent auction item, and someone was leaving that banquet with some terrific hockey history - and one green paperclip, which we will attach to the memorabilia so those who win it know how they came to own it. The Junior Bloggers and I were beyond thrilled about a new trade - and not just because of what was offered but because of the excitement this experiment seems to be generating. I went out to an event one night this week and was asked about the project by several different people. I also sent an email to the youngest Intrepid Junior Blogger's teacher to tell her how she had inspired our adventure, and sent her links to this blog. Apparently those links went all over the school as both girls report having been approached by teachers to talk about the experiment - and they are delighted. You see, I wanted to share it with the teacher because I think teachers can change a student's life - and that student can go on to change the lives of others. I had one teacher in my life that was hugely influential - I would say she taught me how to write honestly. So it was important, I thought, to include the teacher who inspired this all by assigning the kind of homework that makes a student think. That was the start of this experiment - but it clearly was not the end. 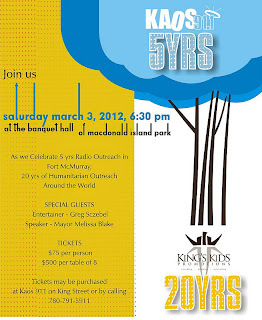 So, people, I will soon have in my hand two tickets to the KAOS 91.1 banquet. These tickets are worth $75 each, but if you take a peek I think they are worth vastly more as you also get live entertainment from Juno-award winning Greg Sczebel, and get to hear a speech from Mayor Melissa Blake (who gets my vote as one of the best speakers in this entire community). You get to spend some time with some wonderful people from our community, support a great radio station, eat some fabulous MacDonald Island food - and continue the adventure of One Green Paperclip. So, the question becomes, of course, what have you got to trade, Fort Mac? The email inbox is empty, and it's waiting for your offer. You can be part of the adventure, because one of the things that seems to cause the most excitement is being a part of an experiment in community, media, social media, making connections - and seeing how far one little green paperclip can go in this little city of ours. Join the Intrepid Junior Bloggers and I on this journey, people - make us an offer and let's see where that little paperclip can go!